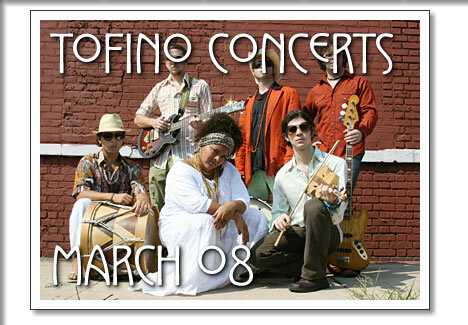 The following concerts in Tofino are happening in the month of March 2008. Tickets are available at Tofitian, Long Beach Market (Esso) and at the Common Loaf. This Brooklyn-based group has taken the seemingly impossible task of melding Afro- Brazilian rhythms of Maracatu, with the funk and jazz from New Orleans. They are rhythm gatherers, harvesting the fruit of 500 years of cultural cross-breeding, which is why the sounds of the northeast of Brazil and the southern United States blend together so seamlessly. Nation Beat performs with an indispensable audacious energy, and seamlessly bridges folkloric Brazilian rhythms with classic American roots music. Rising Brazilian star Liliana Araujo fronts the ensemble with her soaring powerhouse vocals. Rolling Stone Brazil ran a photo of Liliana when the publication listed Nation Beat's track "Old Wooden Chair" as the #1 track on their Hot List. From deep in the heart of British Columbia's Fraser Valley come these four young sisters, multi-instrumentalists, singers, songwriters, and step dancers. Lead Fiddler, composer, and vocalist, eldest sister Shamma was the first female, and youngest B.C. nominee to place in Canada's top eleven at the National Grand Masters Championships in Ottawa. Sarah, the second eldest, brings her experience from the Vancouver Youth Symphony Orchestra to influence the group with a classical twist with fiddle, base and percussion. Roxanna, pianist, fiddler and guitarist, leads the group with her haunting vocals while the youngest in the group, Laila, is known not only for her gift for fiddling but for her high-stepping dance routines. Sister Jill and brother Matthew have set out from their homes in Halifax for a North American Sibling Revelry tour. Both are very accomplished and acclaimed artists in their own right. 2007 was a landmark year for Jill Barber. Back in February she took home two East Coast Music Awards for Best Female Solo Artist and Album of the Year and this year she's nominated for 2 Junos. Matthew just finished recording his latest album Ghost Notes which was recorded at the infamous Bathouse Studio. The Sibling Revelry Tour will see the Barbers backed by The Sevilles, featuring Paul Mathew on upright bass and Les Cooper on piano, guitar and mandolin. If you are a lover of real music this is not a show to miss. Equally at home in the classical tenor repertoire, Lavigne returns to his first love, the musical theatre, performing a program of beautiful melodies, mixed with Neopolitan love songs and familiar contemporary tenor ballads. Founding member of Romanza, Lavigne has toured the uk and us and performed with the Victoria Symphony and for Her Majesty Queen Elizabeth II. He charmed audiences at the 2007 Pacific Rim Summer Festival in Tofino. Tofino concerts in March 2008 from Tofino Time Magazine. Shows at the Tofino Legion and other music events in Tofino.